"Help! I Need Appropriately Complex Texts for my Elementary and Middle School Students!" - Dave Stuart Jr. If you are an elementary or middle school teacher who has ever perused my article of the week lists (disclaimer: Kelly Gallagher is the man who invented Articles of the Week), you've probably wanted to hurt me. This is because my articles are often a stretch even for my ninth graders (after all, the vocabulary difficulty of newspapers has remained stable over the last 50 years, whereas the reading demands placed on K-12 students in the same time period has decreased — see Common Core Appendix A, p.2). So what is a well-meaning K-8 teacher to do? Below, I want to emphasize the awesomeness of two complex text resources for K-8 teachers. I've written about them before, but based on my recent interactions with a group of 5-8 grade literacy teachers, I feel the need to shout these two resources out again. Those two bad things are a stretch. The first one is Nit-picky with a capital N, and the second one is highly unlikely as NewsELA seems to be pursuing a tiered business model in which access to the articles will be free, while more advanced “pro” features (e.g., assigning articles to students digitally; allowing students to annotate digitally; tracking student progress) will be reserved for those with scrilla. So for every single one of NewsELA's articles, there's this option box on the side (see below) that lets you choose the Lexile level of the text. Now, keep in mind that Lexile is only a quantitative complexity measure, and, therefore, it should never be our only guide in determining whether we're giving kids appropriately complex texts (here's a heavily biased, significantly misleading, yet kind of entertaining New Republic article that rips into text complexity determinations that only consider quantitative factors). But assuming that you can easily grasp a concept that the New Republic author couldn't, it is awesome that NewsELA gives us control over the quantifiable complexity of a given article. Like NewsELA, ReadWorks requires an account sign-up, but, again like NewsELA, it's all free, baby. As you can see, each text is categorized by grade level, Lexile level, category (they call it domain), and, controversially, a skill/strategy categorization. You'll also notice that each article includes questions for students to answer. Here's where my big caveat with ReadWorks.org comes in: I'm afraid this site will be used by teachers to print off reams of worksheet-esque articles, poems, and stories to chuck at kids and keep them busy. Like I've said before, we need kids to read if they're actually going to get better at reading (just as badminton coaches need their badminton players to #hittheshuttlecock) — but at the same time, we must protect literacy from turning into a worksheet-driven, instruction-optional thing. We teachers need to choose texts that fit our students, our classes, and the discussions and debates our students are currently having or that we want them to begin having. In other words, please, for the love of all that is sweet, don't use ReadWorks.org as a worksheet generator. 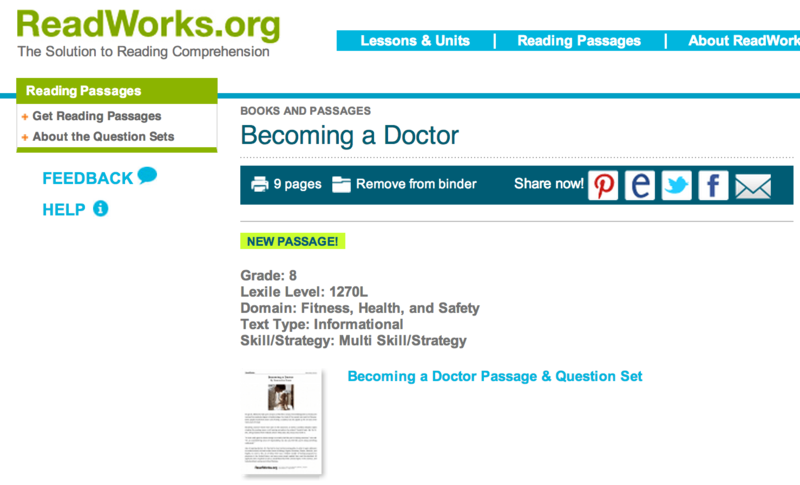 With that being said, ReadWorks.org is a great resource for K-8 teachers looking for places to find appropriately complex texts for their kids. What do you think, K-8 teachers? Am I on point with these resources? What other resources are you using successfully in your search for complex texts that match your grade level? Holler at me below. Tweentribune.com — I will check that out, Andrea! I discovered NewsELA last year and use it very frequently for science articles for my high school biology class. I was so excited about the fact that you could adjust the difficulty of the article, because my students are all over the place in terms of reading ability. The bad part of newsela pro is that they give it to you free for a while, you totally fall in love with everything you can do with it and then they pull the rug out from under you. My district cannot afford $4000. I will definitely still use the articles but being able to instruct students to annotate them and then to track their progress with the quizzes was so cool and now it’s gone for me. Oh, and thanks, Ann, for the additional resources. I added them to my site, too. And HOW STOKED AM I, Dave, that you are dipping into elementary!! Yay!! Dave, thanks for the resource ideas! And thank you, LeeAnn, for more info about the trial period for NewsELA. I also have an account with TeenTribune because their articles are very current and highly engaging. They lend themselves well to mini-debates. Whenever I can, I strongly link the Article of the Week (Kelly Gallagher presented to teachers in my district a few year ago) to our current unit of study. Compelling articles also make excellent sponges as “Info-snack Time,” and I use them on that Last Day of Interim Testing when most of the students are finished and we’re waiting for a few kids who were absent to make-up their tests. We read closely for the “snacks”…tidbits of info, research, unique claims, or author commentary, and the students sort them into levels: the “chips” are fun and light; the “cheese” is nearly unbelievable; the “sliders” are everybody’s favorites. A person could slip a “slider” tidbit into a conversation and sound smart, well-read, and connected to the real world. It’s usually great fun and keeps the kids who finish the tests quickly highly engaged while waiting for the kids who need more time. Cool, Susan! That’s a great way of looking at the info snack time. There are always those times where we’re done with a project and waiting for just a few kids to catch up. I’m totally going to use your analogy! Much of this information can be found on social media or on the same Google. Enter the information you need and then type the PDF end. While I teach math, I try to use my 30 min. Advisory period as an opportunity to read, aloud usually. I’m just going to scour my bookshelves and magazine rack at home, grabbing things I’ve read recently, or what I read 30-40 years ago (I’m a sci-fi guy, and have a treasure trove of comic books). While I remember my ‘reading level’ back then being high, it seems the complexity of the things I read (‘20,000 Leagues’, Lord of the Rings, etc.) is appropriate for 13-14 year olds. The fact that you, as a math teacher, use your Advisory as an opportunity to read speaks highly of your alma mater 🙂 (Go blue.) I think the ability of 13-14 year olds today tends to fall slightly below what you were doing with Jules Verne and JRR Tolkein — mostly because today’s kids have a lot more entertainment to choose from, perhaps. But I bet that, in the hands of a passionate, able educator like yourself, your kids love these advisory times with you! I just checked out all of the great suggestions and feel almost ‘wealthy’ now! I like Newsela.com and have somehow been left in the free trial PRO zone for the last 6 months. I really haven’t used it much until now (summer school). The kids really liked the online annotations feature versus the Kelly Gallagher method I had been using all year in my regular classes. I have to say it is a big step up and I hope me free trial continues…. I teach 8th graders and use all of those sources for articles – (newsela is amazing) – but they can handle some of the articles of the week from both your list and Kelly’s. They just need more time with it and a bit more discussion possibly. They are able to stretch a great deal upwards! Does Kelly Gallagher ever post lexile levels for his articles of the week? I am a student with experience of newsela. The question’s answers are VERY biased, especially when it comes to politics.